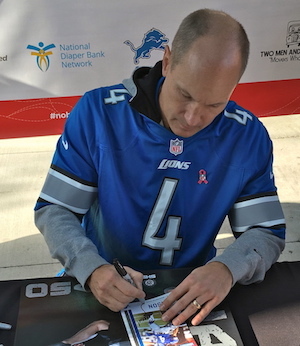 Here is an original photo (courtesy of Lance Martinez from My Detroit Sports) chronicling former Detroit Lions kicking great Jason Hanson appearing on behalf of the “Huggies No Baby Unhugged” diaper drive. The recent appearance took place on Pride Plaza, located on Brush Street, right outside Ford Field. The event occurred in conjunction with the Lions multi-year partnership with the diaper company. Hanson played 21 seasons for the Lions, the most years that any NFL player has ever spent with one team. His 327 games with Detroit stands as the most games with one single team in history. The 1992 second round pick retired with the fourth most field goals in history (495), amid appearing in two Pro Bowls. Lions fans can check out numerous other original stories, chronicling the team, over the last few years.